The abortion clinic was crowded and cold, and a giant cattle call of death. I was driven to the clinic by a high school friend who was as frightened and bewildered as I was. I waited in the lobby with all the other women, and I cried and cried and cried. Deep in my heart, I knew what was happening was wrong. I was harshly scolded by a clinic worker who barked at me to stop crying. Not one staff member there offered a kind word, a tissue, a shoulder to cry on, or most importantly another option. I felt trapped, unloved and deeply rejected. I remember speaking with another woman in the waiting room who was hysterically crying too. She was already a mother and her husband was forcing her to abort their child. I will never forget her tear-stained face, as we both sat in that room our chests heaving with grief waiting for our turn to kill our babies. After that abortion, all my dreams and self esteem were shattered. It was not the fairy tale I had dreamed of. I compensated and survived what had happened by acting out in rebellion and extreme defiance, drinking and partying. I self destructed and had another abortion a few years later. I rarely spoke about what had occurred in my life, and I pretended I didn't care. But deep inside I was scarred and broken. I felt worthless and alone. I held onto my secret for years, particularly when I was in church. If someone said the word "abortion", I would run to the bathroom to silently sob, just like I had done so many years ago in the abortion clinic. I was a mother now, after all, happily married with three beautiful children. And I was a Christian. I thought, what kind of mother does this? I was so deeply ashamed. Of all my accomplishments - educationally and work-wise - motherhood and family was my greatest, and I could not wrap my head around the fact that I had killed my children for something as comparatively meaningless as a "career". I knew in my heart that I could have written those kids into my life with a little creativity and hard work, and that we would have been okay, whether I had raised them or someone else had through the loving option of adoption. I finally came public with my story a few years ago when I was in my early forties when I found myself in a very unique situation in a public identity mix up when a woman with my same name who lives in my city was accused of murder. Everyone thought it was me when the story of this other "Sandy Arena" hit the news. I initially set myself apart from her in self-righteousness and claimed to be the "good" Sandy Arena, not the one accused of murder and who was all over the news. That was my initial reaction, until I honestly looked deep inside my heart and I knew this was not true. I knew that I had taken the life of others - my children - even though society did not call it as such and that I had no right to set myself apart in righteousness. I shared my heart, my thoughts and my sympathies for the other parties involved in this situation in an opinion essay in our daily newspaper and my abortion story was out. It was terrifying, but I was free. The biggest surprise from this experience were the many, many, many women who came to me to tell me that they too had regrettably had abortions. I was saddened to know they too silently suffered in shame, and wondered what I could personally do to lift the dark cloak of shame that often envelopes those who partake in this choice - whether they went on their own accord, or were sent or coerced to go there by a husband, boyfriend, parent, grandparent or other authority figure. I was so impacted by this very unexpected and public abortion confession and this revelation, that I wrote a live, traveling show to share my story. It has become my life work. It is called The Life Ballet and it is performed by the ballet company my husband and I founded in 2006. This live production is written in the form of a letter of regret to my unborn children where we share a message of life, hope and healing to the people suffering as I had suffered in the aftermath of the "choice" of abortion for so many dark and horrible years. We have performed our show around the country and also in Canada for seven years now, and the show was recently adapted into a feature length film by my company and in conjunction with Verb Records. It is my art and my heart and the best way I know to tell my story of regret and hope in the wake of abortion. It is one way I can honor my children's lives. It's the birthday party, graduation party and wedding event I was never able to throw for them. I know it's "my story", but I say it's "many women's story" with one in three women having an abortion by the age of 45. There is nothing I can say that can trump what is shown on stage in The Life Ballet (and now in film with "Arise Sweet Sarah") through the power of music and movement. My oldest daughter plays the lead character in the show whose name is "Sarah" and for this I am humbled and grateful. My youngest daughter Anna dances the part of "young Sarah". I will end my story to say that abortion has far reaching consequences not just to women, but to men, siblings, aunts, uncles and the whole community. One abortion affects 40 people in a lifetime. Here is one such example. In a mother/son bonding moment I had with my son when he was 10 years old (he is now 13 years old), I asked him how he knew I loved him. He answered without blinking an eye, "Because you didn't abort me." This interaction with my beloved son broke my heart into a million pieces. 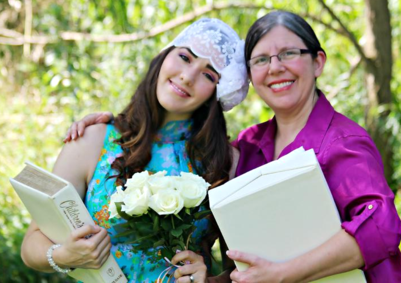 It was certainly not a moment I ever dreamed I would have one day with my "wanted child" when I was 18 years old in an abortion clinic killing my "unwanted child". Our latest project is our film "Arise Sweet Sarah" which is based on our live production. The film was released September 2015. Arise Sweet Sarah shares a message of the value and importance of all human life, as well as a message of healing, forgiveness and grace in the midst of unthinkable grief in the wake of lost motherhood. It is based on the testimony of Sandy Arena and includes performances by both of her daughters Annaliese Arena and Alexis Gaetano and her husband Sam Arena. The story is told through a powerful combination of narration, acting, original score and a combination of modern dance and ballet. Filming took place in Rochester, NY during the summer of 2014 in conjunction with Verb Records. Verb Records was recently named the Record Label of the Year by the IMEA awards. This is just one chapter in the hundreds of chapters that make up my life. But it is one that I care deeply about and one that changed everything in my life. This story matters so much to me that I wrote a live theatrical production about it called The Life Ballet that was adapted into a film called "Arise Sweet Sarah" in conjunction with Verb Records after two years of writing, editing, filming and post production work on both the film and soundtrack. "Arise Sweet Sarah" was released September 12, 2015 at the world famous George Eastman House's Dryden Theater in Rochester, NY. My family and I and many others have traveled all over the United States and into Canada with the live version of the show since 2008 to share truth and hope to the next generation, and to those who may be suffering after abortion as I silently suffered for so many years. One in three women will have an abortion by age 45, so I know I'm not alone. Thank you for reading it and for treating my heart with kindness. It's not easy to bare such a tale, but I do so so others may find peace and healing too. My oldest daugther Alexis dances the part of "Grown Sarah". My youngest daughter Annaliese plays "Young Sarah". 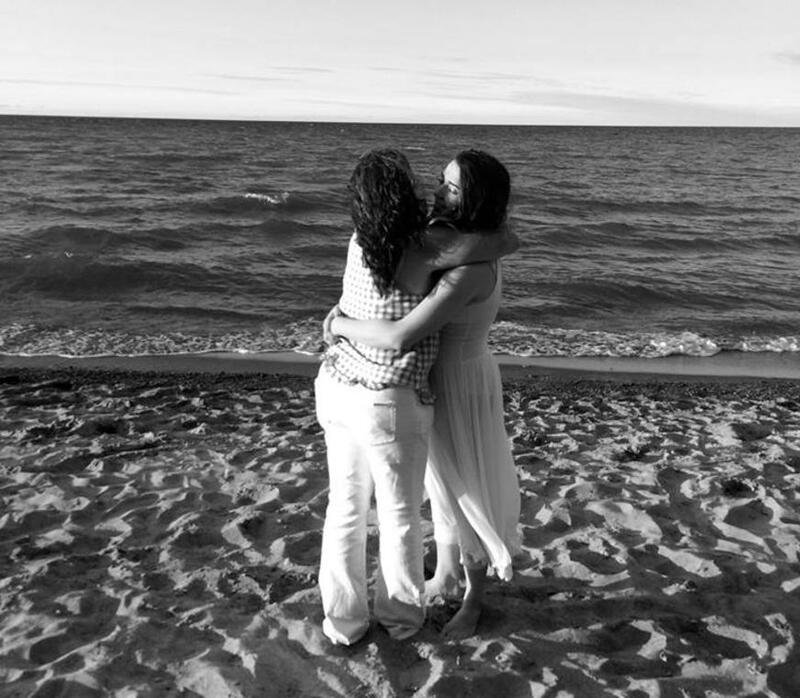 My most precious moment after filming Arise Sweet Sarah 85 hours in one week hugging my beautiful daughter Alexis on the beach at Lake Ontario. This is where we filmed our heaven scene and a few other "healing" scenes where the sun was glorious and the skies were ever so blue. God even sent a flock of birds across the sky in one of our most important moments when "Sarah" curtsies in appreciation to Jesus. It was a very special and emotional time where we all were crying real tears of sorrow mixed with gratitude and joy for all Jesus had done for us that week.